We started a new spec home in Austin, Texas and the framing is almost complete. That means it’s time to choose the exterior finishes. The home will be similar to this one, with different roof lines. 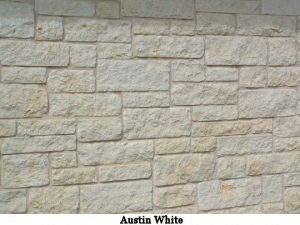 We always like to put some stone on since that’s what we do in central Texas! We will put some limestone on the front of the home. With this one, there will be stone near the front door (like the one above) and on the facade with the garage doors. 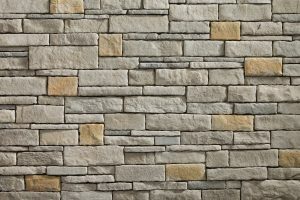 There are different shades, sizes and shapes of limestone. I think for this home, we will do limestone chop in 2-3 different sizes. We usually do typical mortar lines as opposed to a dry stack, where you can’t see any mortar. 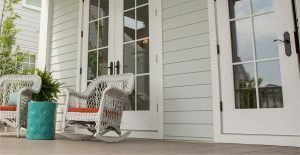 The rest of the home will be Hardie siding, which is an awesome, concrete based product that is resistant to mold, impervious to termite damage and can be painted any color. There are different styles and sizes of this as well. 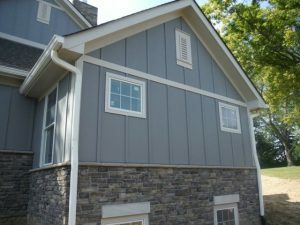 For this home, we will do a smooth lap siding and a board and batten style. Right now, I’m thinking we’ll do the board and batten on the majority of the home and lap siding on the bump-out on the back of the home where the patio is located. This will break up the design a bit and give it some interest. Now, what color to paint the Hardie? 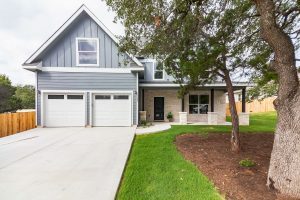 For the last couple of spec homes we’ve built, I’ve chose a dark gray with white stone. I try to choose neutral-ish colors that a wide range of buyers will like. 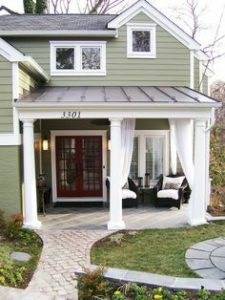 For this home, I am going to go with a tan exterior and white trim. The majority of the roof will be a dark brown composition shingles, and the roof over the porch will be a bronze metal, like this look. Again, this will add some interest and curb appeal. Hopefully all these finishes will come together and people will love the look of this new home! Can Our Kids Realistically Play Multiple Sports?